This month the Virtual Book Club for kids is celebrating books by author Jan Brett. We have many favorite Jan Brett books and several that have a Christmas theme. This month, I decided to choose the book Gingerbread Baby by Jan Brett. I created some book activities to go with this book. 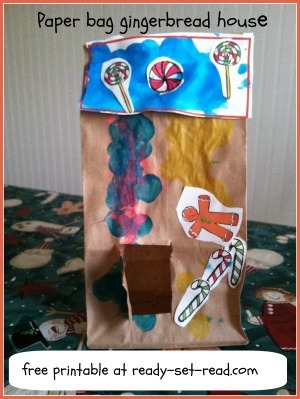 We made real and paper bag gingerbread houses in order to retell the story and work on story comprehension. 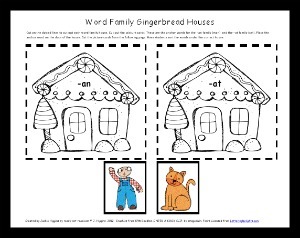 We also did word work activities with gingerbread houses. In order to run off a little pre-Christmas energy, we played a gingerbread hide and seek game. 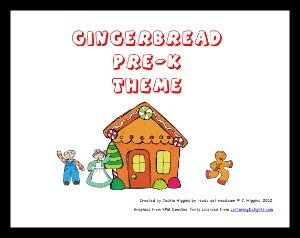 You can find all of these activities in my free printable gingerbread theme for preK. This book is especially fun at Christmas when planning your Christmas stories and Christmas activities for kids. In this story based on the classic tale, The Gingerbread Boy, a young boy named Matti works to make a gingerbread boy. Matti, however, peeks in the oven door before the allotted cooking time is completed. The cookie baby escapes and the chase begins. This book is a nice twist to the unhappy demise of the original Gingerbread boy. Jan Brett is as widely known for her mad skills of illustrating as she is known for her wonderful children's tales. This book is no exception. The illustrations are very detailed and Brett uses framed borders to weave parts of the story in a wordless fashion while the story is being read. The details of her books make her work a good choice for older preschoolers through early readers. After reading Gingerbread Baby, we made crafts, practiced our retelling skills, played games to hone our word work skills, and even did a little discussion and journaling. 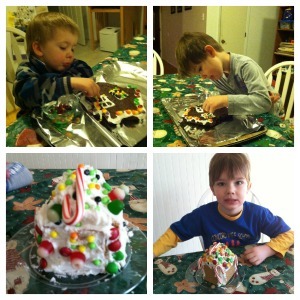 The boys had opportunities to make messy gingerbread houses this year. We've made gingerbread brownies and gingerbread houses made from milk cartons cover with graham crackers, icing and candy. Sometimes, though, it's great to have a less mess option for gingerbread houses. Paper bag gingerbread houses are a good "less mess" option. I have a free gingerbread printable with directions for making these little houses. We used our paper bag gingerbread houses when we reread and retold the story. 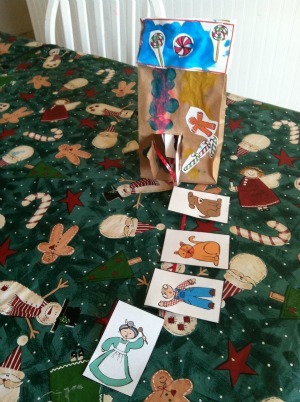 I gave Logan (my four year old) picture cards to help retell the story. We worked together to sequence the cards in the order of the story. We taped them to a licorice rope ribbon and stuffed it into the house. Now, he can pull the cards out in order and retell the story. The picture cards are available in my free gingerbread packet. Since we were working on "houses" we also focused some energy on sorting word families into the correct word house. Of course, our word houses had to be gingerbread houses! 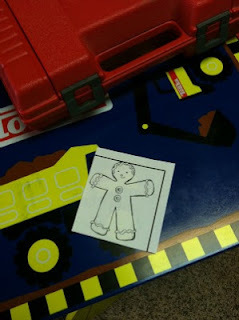 We used the words man and cat as anchor words and we did a picture sort of word cards. These are all in the free gingerbread printable as well. The packet also contains free gingerbread babies which you can hide around your house and "catch" the gingerbread baby as you run, run, run as fast as you can. There are also writing prompts that can be used for written or drawn responses to the reading. Since gingerbread is often enjoyed in the holiday season, this book activity is a great choice for the month of December. The book also works well because it doesn't make a mention of a specific winter holiday, which allows Gingerbread Baby to be used in a more general setting. You can download this packet for free in my Teachers pay Teachers or Teachers Notebook Stores. I'd love if you'd follow while you are there. Jan Brett is a wonderful author to fill your winter months, so I'm super excited to be co-hosting the Virtual Book Club with a group of bloggers. If you have a book activity to share for a Jan Brett book and you have a blog, here's how you can participate. If you don't have a blog, I'd still love to hear how you are celebrating Jan Brett. Leave a comment on this post. Link up only posts inspired by Jan Brett that share children's book inspired crafts, activities, recipes, etc. Any other posts will be deleted.